Australian cities have been ranked among the best in a British survey of the world's most liveable cities. Melbourne came third behind Vancouver and Vienna, out of 140 major centres. Perth was equal fifth, Sydney ranked ninth, Adelaide was 11th place and Brisbane 16th. The survey assessed cities based on stability, health care, education, infrastructure and culture. After being here almost 9 months now both Inge and I vote Brisbane better than Perth. Melbourne is a nice city but the climate in wintertime is like Europe wet and windy. I would say that Vancouver is right to win it and is very nice having been there but what put me off Canada was they almost have no holidays to speak of so cant enjoy themselves because they are too busy working! 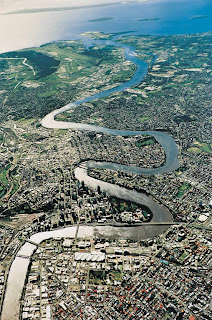 The aerial photo I attach is good as it shows you the Brisbane River meandering out to the ocean and Moreton Bay. You can see the Port at the end of the river. That was a real nice boat cruise a few weeks back, must do it again if we get visitors. 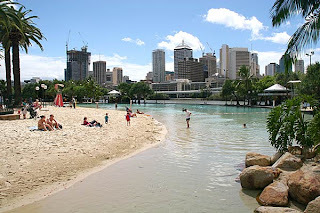 The photo of the beach is of the South Bank and the childrens beach area, in what place other than Rio de Janeiro can you laze on a beach right in the middle of the city.